Anni is professional juggler and performer. Her acts inspire international audiences around the United States, and Europe as well as Japan, Singapore, Israel and Gabon. Originally born in Bonn, Germany in 1988, Anni started juggling at the age of 14. 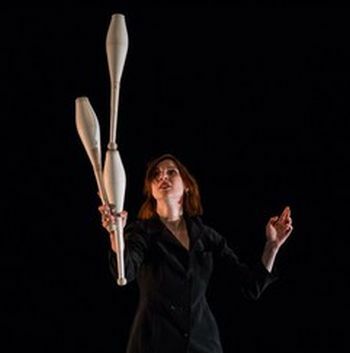 At the Academy for Circus and Performance Art, Netherlands where she received her Bachelor’s degree in 2013, she developed a striking juggling style. Her acts are shaped by conceptual ideas coming from Performance Art and convince with high skills and a charming, authentic stage character. As a versatile performer with solid knowledge in theater, dance and music Anni has recently been participating in different productions around Europe. On the side, she teaches workshops and coaches young performers for acting on stage.